Another new freebie! These free digital stamps are all instant downloads, so you can start enjoying them straight away. Save them to your computer or memory stick and you can use them as often as you like. 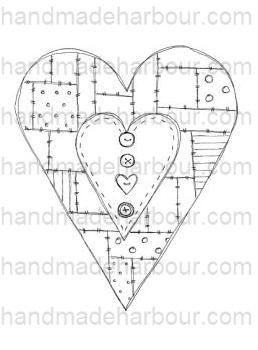 Here's your new free Patchwork heart digistamp - just click the link to download! 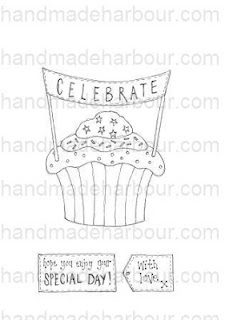 It's not too late to get afree cupcake digistamp either! 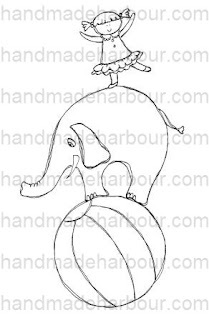 For lots more digital stamps (and more being added every week) please head over to the Handmade Harbour website. Handmade Harbour has an Angel policy. You can use our stamps and patterns to make items by hand and sell them. There is more detailed information on the website. If you are new to digital stamps, you can read more about what them on my blog post What is a Digital Stamp? So sorry! I don't know what went wrong there, but I've re-uploaded the image and it seems to be working ok again now. What a lovely offer, and your stamps are wonderful. This download isn't working though. I get a big Pinterest logo over the download button when I try to click it. 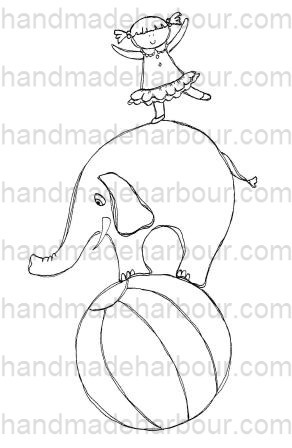 The Pinterest logo is automatic on my blog images at the moment and may have to be removed! Sorry! You can click to one side of the logo though, and it should work. I'll have a look at getting a text link for now, which might be the quickest solution. It's a text link now - that should make life simpler! Love the designs. Can't wait to play. Beautiful! I got the heart digi. Thanks so much for these adorable images. I got the heart and the cupcake. I can't wait to make a card with them. They're adorable - have you thought about selling them? It could be a pretty brilliant small business idea. If you decide to do so, it's worth to take the marketing very seriously. This page shows how you can make it super effective!